This guide is intended to address care and maintenance of Florida Tile porcelain products used as a floor in a non-residential setting. However, the guidelines here are also applicable to residential installations of porcelain tiles. When properly installed, porcelain tile is very low maintenance and should provide many years of trouble-free service when properly maintained. This document will not be able to cover every possible cleaning and maintenance situation, but will attempt to address the most common. Tile is an excellent choice for environmentally friendly care and maintenance. Tile does not require periodic re-application of finishing products, nor does it require strong chemicals to clean. When selecting cleaning products for your tile, LEED® (Leadership in Energy & Environmental Design) for Existing Buildings suggests looking for “Environmental Choice CCD-146 or CCD-147” compliance. Alternatively, “Green Seal GS-40” compliance is required to get a point under IEQ credit 3.3. Please see the link below for more information. Florida Tile’s PTCA (Porcelain Tile Certification Agency) certified porcelain tiles are fired at extremely high temperatures to have a very low residual porosity. It is porosity that can cause tiles to be stained by grout (the microscopic pores in the tile pick up the color from the grout). The worst-case scenario is a tile with some residual porosity on the surface being grouted with a high contrast grout color (i.e., unglazed white tile being grouted with black grout). Typically, glazed porcelain does not require any grout release product and will not stain. Unglazed and especially polished porcelains may require a grout release product to resist staining. Florida Tile recommends a test patch be grouted by the installer to see if the tile picks up any stains from the grout. If so, a grout release product should be applied to the tile prior to grouting (the grout manufacturer should be able to recommend one for use with their grout). If no stain is noted, it is safe to grout the remainder of the floor. The most important cleaning a tile will receive is during installation. The number one cleaning issue with tile is grout haze. Grout haze is caused when water that contains trace amounts of grout or setting material is allowed to dry on the surface of the tile. Care must be taken to completely remove all traces of grout from the surface of the tile during installation. Typically this is done at the time of installation with a diluted, neutral pH cleaner followed by a thorough rinse. This involves rinsing multiple times with clean water until no visual evidence of cloudiness is apparent in the rinse water followed by dry toweling of the surface with a clean towel. Grout haze can be recognized by the tiles having a different amount of gloss when viewed at an angle or when dirt adheres to the tile easily and is difficult to remove. This haze is grout that has been allowed to cure on the surface of the tile and cannot be removed with damp mopping or steam cleaning. If grout haze is discovered on the tile after installation, additional scrubbing with a nylon scrubbing pad (or a rotary buffer with a nylon pad for large areas) and grout haze remover is recommended. It is imperative to follow the manufacturer’s instructions. Florida Tile does not typically recommend the use of ‘acid washing’ for cleaning grout haze. Acid can react with the grout and leave a white film that is very difficult to remove and/or structurally weaken the grout joint. If use of the nylon scrubbing pad is not sufficient to remove the grout haze, a mild solution of sulfamic or phosphoric acid (NOT hydrofluoric) will not harm the tile and can be used for cement-based (non-epoxy) grouts by closely following the manufacturer’s recommendations including thorough rinsing. If an epoxy-based grout is being used, the grout manufacturer will have specific recommendations for removing epoxy grout haze. After installation, tile should be protected from foot traffic until the grout has had time to fully cure (up to 14 days, consult grout packaging or manufacturer). Typically this is done with cardboard, construction paper, plywood, or a similar covering. Florida Tile does not recommend plastic for this purpose as plastic does not allow air to reach the surface of the grout and can be slippery when wet. It is typically not necessary to apply a sealer, wax, or other surface coating to porcelain tiles. In fact, the use of these products can be detrimental to the long-term maintenance of the tile. Sealers and waxes can discolor and wear off, which will require re-application. These coatings can also diminish the slip resistance of tile. The one exception to this statement is polished and unglazed porcelains. Polished and unglazed porcelains may benefit from a onetime application of a penetrating sealer to reduce the likelihood of staining. Closely follow the directions of the penetrating sealer for proper application. It IS acceptable and recommended to seal the grout with a silicone based sealer when using a cement-based grout to reduce the likelihood of future stains. The grout manufacturer will have recommendations for products to use to seal their grouts. It is important to clean up spills and stains quickly. For routine maintenance, vacuum, dry mop, or sweep debris from tile regularly so it does not abrade the surface of the tile. Routine sponging or wet-mopping with a neutral pH diluted detergent or simply water is typically sufficient for cleaning tile. Do not use cleaners with oils, soaps, or fats as ingredients as these can build up on the surface of the tile over time and attract more dirt. Mechanically remove sticky residue (such as chewing gum or stickers) with a putty knife or spatula before cleaning. For food and grease stains, de-greasing cleaners such as Windex®, Fantastik®, or Formula 409® are typically fine, but should be tested in an out-of-the-way location first to make sure they do not react with the tile or grout as they are alkaline in composition. Abrasive cleaners such as Soft-Scrub®, Comet®, or Ajax® should be used sparingly and rinsed thoroughly with clean water. Florida Tile highly recommends using commercial cleaners for routine maintenance. Commercially available cleaners such as Custom®’s Tilelab® Grout & Tile Cleaner, Aquamix®’s Concentrated Stone & Tile Cleaner, and Miracle’s Porcelain and Ceramic Tile Cleaner are all safe to use on your Florida Tile porcelain. Refer to the manufacturer’s instructions for the concentration of each product to use and when to use them. Tougher stains (such as lipstick, oil paint, wax, etc.) may require the use of a poultice. A poultice is available from most tile retailers and is made into a paste with the addition of water. It contains gentle abrasives which can remove the stain. Again, care must be taken to thoroughly rinse the area where a poultice has been applied. A nylon scrubbing pad or bristle brush can also assist in removing stubborn stains in combination with any of these cleaners. Hard water deposits can occur on tile when it is routinely in contact with water containing minerals. The best way to clean hard water deposits is before they form by using a squeegee to remove the water and then drying with a towel. Once hard water deposits form, a chemical cleaner designed specifically for hard water deposits must be used. Florida Tile has not tested every chemical with every tile, so before trying any cleaner on a tile for the first time, it is best to try it in an inconspicuous location to make sure it does not harm the tile or grout. Porcelain tile is very durable and should not react to most chemical cleaners. Properly maintained tile floors should not require the use of rotary buffing and polishing equipment. This equipment can wear the surface of the floor over time and should not be used on tile as a routine cleaning method. Steam cleaners can be used on extremely dirty floors and should not harm the tiles. However, be aware that steam cleaning will not clean chemically attached stains like grout haze and hard water deposits. Consult a knowledgeable tile-cleaning specialist for unusual cleaning situations. 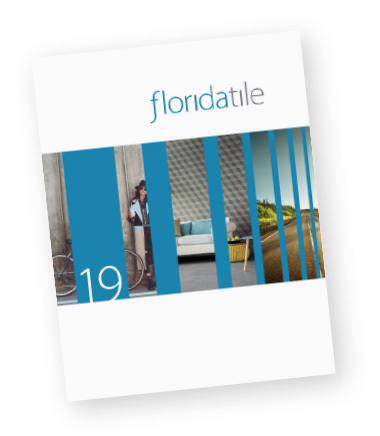 For more detailed information on tile installation and maintenance, visit www.floridatile.com or review the TCNA (Tile Council of North America) Handbook Guidelines.